NATO is expecting to take its final decision about increasing a few thousand more troops to Afghanistan to end the current “stalemate” and to further strengthen Afghan special forces and Air force in the month of June, NATO top official said on Wednesday. “We have recently completed our regular review of our training mission. And our military commanders have asked for a few thousand more troops. We are currently in the process of force generation and I expect final decisions to be taken next month,” speaking ahead of NATO meeting, the allies Secretary General Jens Stoltenberg told reporters. 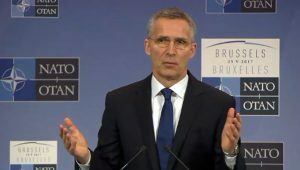 Further accepting the “challenging” security situation in Afghanistan, NATO Secretary General said that in Afghanistan the aim is to find a “negotiated political settlement”. He urged Russia to be “part of an Afghan-led peace process”. He also praised Afghan forces for being able to hold their ground against insurgents attacks. Currently, NATO has about 13,000 troops in Afghanistan, of whom about 8,400 are American troops. Recently, the U.S.-led NATO commander in Afghanistan, General John Nicholson, asked for a “few thousand” troops to break the current – what he called “stalemate” in the country. The U.S. and its allies are expected to deploy 3,000 to 5,000 additional troops to assist, train and support the Afghan forces, but already a number of countries including Germany have announced that it is not looking to increase its presence in Afghanistan. On Thursday, heads of State and Government in NATO will meet in Brussels where the U.S. President Donald will participate as well to discuss NATO’s contribution to fight against terrorism and burden-sharing.